Who is offering this program to make you able to compete with your peers. Merit is going high and high every year but we know our intelligent students can beat every competition they just need the right direction and guidance to achieve their goals. Stars academy Lahore hires professional teachers for every subject who have played a great role in entry test preparation programs for many previous years. Our teaching methodology helps F.Sc students to get great achievement in Entry Test LIKE MDCAT , ECAT , FUNG , NUMCAT. Our program includes all sorts of Entry Tests that consider in top Universities after intermediate (F.Sc Pre Engineering or F.Sc Pre Medical) and A-Level Exams. We proudly announce in past years, those students who got Entry Test Preparation Program by Stars Academy Lahore are now working as Doctors, Engineers and IT Professionals. Many students have currently enrolled in MMBS or a different field of Medicine, Engineering and other top fields of studies. Our Teaching methodology Includes dedicated and committed Expert Teachers, Preparation Resources including the full pack of MCQs, Entry Test Books, guideline to solve paper in shortest time, career counseling and many other. 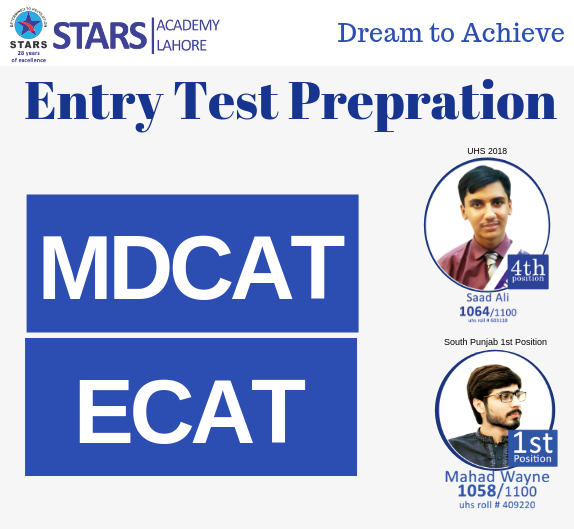 Courses offered at Stars academy are MDCAT, ECAT preparation, FUNGAT, NTS, LMDCAT (UHS Exclusive), LMDCAT, NUMS (Exclusive), LECAT,MDCAT (Crash Program), NET (I, II, III), LUMS (SAT-I, S.S.E), LUMS (SAT-I, S.S.) + NET (I, II, III). Admissions are open hurry up limited seats left. Stars Academy Lahore Revision and Test sessions for this program are designed to revise the overall syllabus thoroughly. Our vision is to provide a respectful educational environment to our students. Stars Academy Lahore knows that our students who are ready to make their future in renowned institutes must have excellent critical thinking on the era of the field they chose for themselves. We also provide career counseling to our students to learn what the career opportunities of the major subjects are. Our program does not only give you excellent aggregate to enter a top University but also develop your career thoroughly according to your field. MDCAT is the entry test for the students who want to get admission in any Medical College or University to complete his or her studies in the field of Medicine. MDCAT stands for Medical & Dental College Admission Test, based on MCQs. Its eligibility criteria is you must have passed the F.Sc Pre Medical in your Intermediate. ECAT stands for Engineering Colleges Admission Test. It is the essential for those who want to take admission in Engineering Universities. It is MCQs based test. Famous engineering University UET (University of Engineering and Technology) arranges ECAT for public sector every year. National University of Science & Technology (NUST) Admission is based entry test conducted by NUST is known as NET. NUST conduct NET three times in a year, students can take all NET test or only one. The Long MDCAT (Medical and Dental College Admission Test). LMDCAT Test stands for Long MCAT/MDCAT which is the best possible utilization of the maximum time available to the students during and after Intermediate final exams till the UHS entrance test (MCAT/MDCAT). National Testing Service - Pakistan is an association in Pakistan that controls scholarly execution assessment tests. It is like Educational Testing Service in the United States. NTS offers two primary sorts of tests, the National Aptitude Test and the Graduate Assessment Test. "Courses offered at Stars academy are MDCAT, ECAT preparation, FUNGAT, NTS, LMDCAT (UHS Exclusive), LMDCAT, NUMS (Exclusive), LECAT,MDCAT (Crash Program), NET (I, II, III), LUMS (SAT-I, S.S.E), LUMS (SAT-I, S.S.) + NET (I, II, III). Admissions are open hurry up limited seats left."